All week, we look for stories that help New Mexicans better understand what’s happening with water, climate, energy, landscapes and communities around the region. Thursday morning, that news goes out via email. To subscribe to that weekly email, click here. Meanwhile, on the BLM’s automated federal public posting report website, there are more than 100 APDs posted in the state since Dec. 22. • For the Santa Fe New Mexican, Andrew Oxford reported on some expensive “relationship building” between an oil and gas lobbyist and members of the state’s Legislative Finance Committee. • States that rely on water from the Colorado River have until the end of the month to get a drought plan together, under a federal deadline. The sticking point, as it has been historically, is Arizona. Lots of reporters are covering the issue, including Ian James and Andrew Nicla at the Arizona Daily Republic, Tony Davis at the Arizona Daily Star, and Luke Runyon at KUNC. • The winter weather this month has been amazing. But we still need more of it. 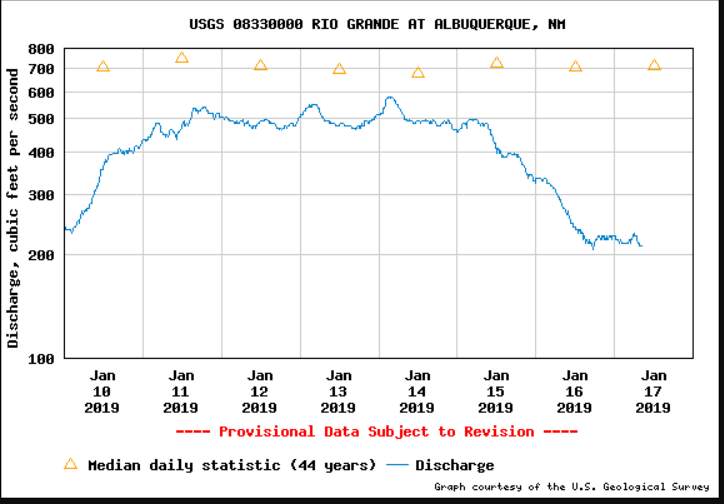 I’ve noticed the past few days how low the Rio Grande is through Albuquerque (just over 200 cubic feet per second) and John Fleck tweeted this week that while the snowpack in the Upper Rio Grande is better than it was last year, it’s still below average.